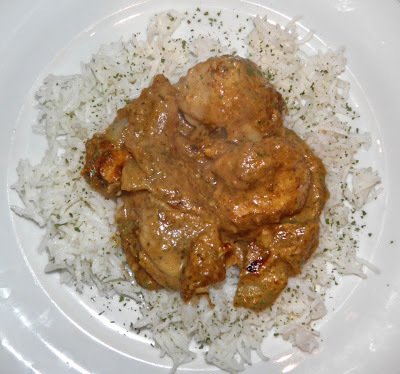 Thickened with nuts, honey tinged and aromatic – with just a little heat. Just before we moved to the country we went shopping at our local "city" grocery. We were commenting on things that we probably wouldn't be able to find once we moved to the country. First, I was wrong. There is almost the same selection in Bridgewater (and even Liverpool) as in the city groceries, just less volume. Such is the strength of chain stores, to my benefit. One of the products we thought we would never see in the country was a jar of imported almond honey tagine sauce we spotted. We had never seen it before. The word "tagine" has two meanings. It is a food, but also a two-part cooking vessel popular in Morocco. The bottom is a wide shallow dish. The fitted top is distinctively shaped like a cone. I'm sure you've seen them in trendy cooking supply stores. I don't have one (yet) but from how it works is that the clay bottom heats to high temperature while the top acts as a condenser and redirects all the steam and juices back down into what is being cooked. Kind of like a slow cooker. So back to the cooking sauce we saw… Since we were cutting back to basics in anticipation of our move we didn't buy the sauce. It would have been just more thing to pack. Luckily the side of the container gave all the ingredients, plus directions for all of us who don't have a specialized tagine pot..
Cut the chicken in large(ish) pieces. So I did something clever. I found the product online and wrote down what was in it. Mind you, there were no quantities—just ingredients—so this sauce may or may not bear much resemblance to what was in the store. I do know one thing. Whatever I made, it tasted really good. There's something about Moroccan cooking that is very special. Maybe it's the aromatic spices. Maybe it's the use of dried fruit, honey and citrus. Or it could just be the sheer exoticness of it all. This dish does not have to cost you an arm and a leg (just a couple chicken breasts). Buy chicken when it's on sale. Get almonds, dates and uncommon spices at the bulk food store. Buy only what you need/want. That way you don't have to pay the price for pre-packaged amounts at the grocery.. I do have to say this sauce will certainly grace our table again. In my directions the recipe calls for just "stock." That's on purpose. Pick the stock to correspond with the meat. 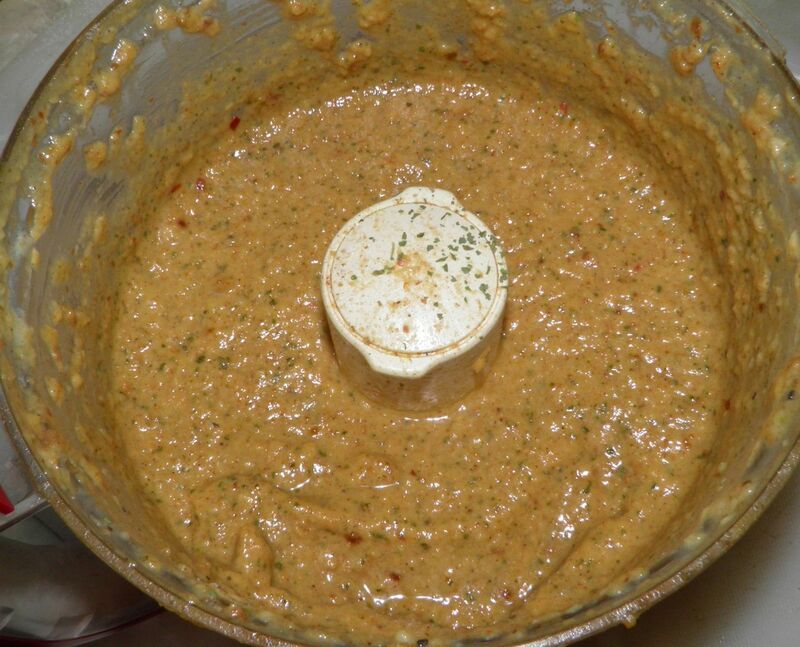 You can use this sauce with beef, lamb or chicken (like I did), or even vegetables. It really wasn't that difficult to make a sauce that tasted quite authentic. I guess all my previous experience cooking Moroccan food paid off. 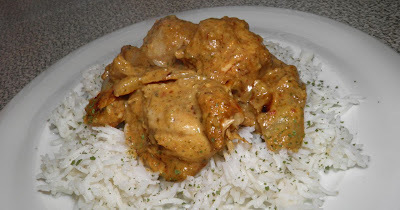 Make this dish and impress family or friends. It's really good. A little Morocco on the South Shore of Nova Scotia. Indeed! Brown both the onions and chicken to add depth of flavour. 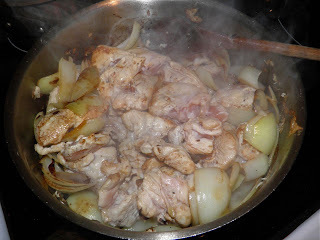 Simmer the chicken and onion in the sauce until done. 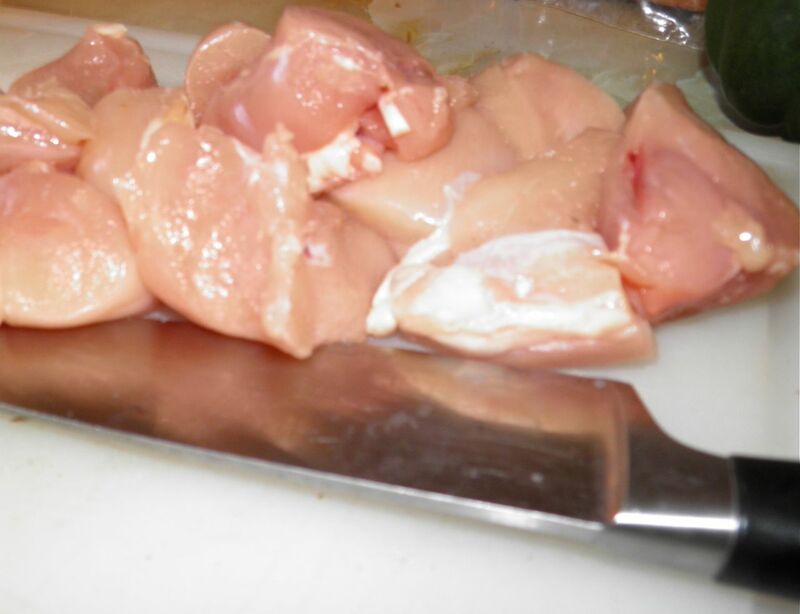 Cut each chicken breast into 6-7 large pieces. Set aside. Halve the onions and cut each half into 3 pieces. Set aside in a different bowl than the chicken. Using a food processor, grind the whole almonds until they are a coarse meal. Dice the dates, add to the almonds and process again. Scrape down as necessary. Add the onion, garlic and ginger and process for a third time. Then add the honey, stock, spices, coriander and lemon. Start the motor and let the mixture process until quite smooth. 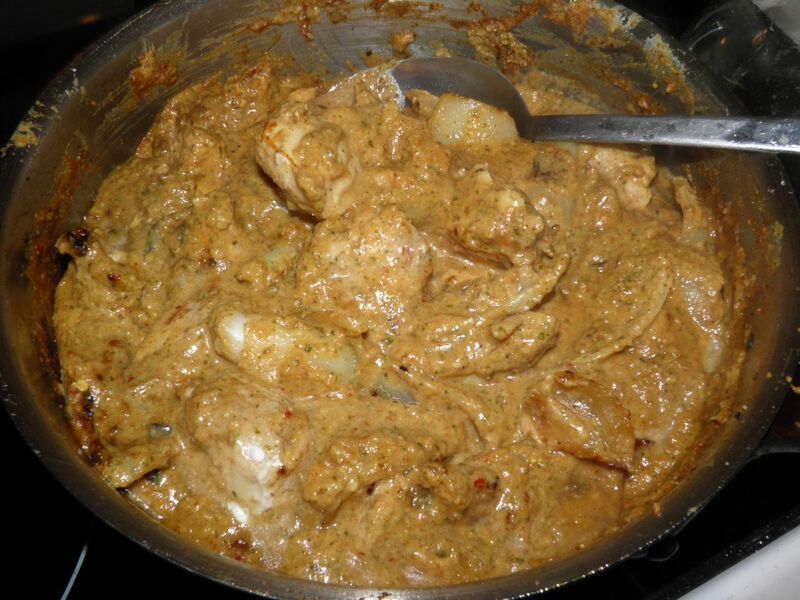 Try to make the almonds part of the sauce, not nutty chunks in it. Add the salt and pepper, pulse and taste. Adjust as desired. The sauce will be quite thick. To finish the dish, place the remaining 1 tbsp of olive oil in a wide sauté pan with a lid. Cook the onions on medium high until they start to brown. Then add the chicken and let it brown slightly as well. Pour in all of the sauce. Bring to a simmer, reduce heat to medium low and let cook for 10 minutes. Stir occasionally. Serve with rice or couscous, garnished with chopped coriander leaves. "Oh, wouldn't it be loverly..."